Soft Skull Press, 9781593763091, 192pp. Named a 2019 Writer to Watch by the Los Angeles Times, Richard Chiem has written a new novel that is equal parts sledgehammer and sweet song. 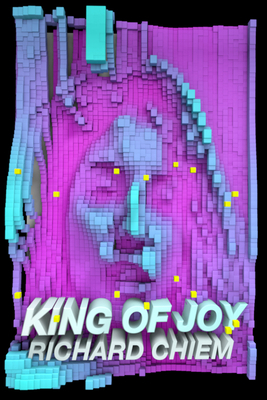 King of Joy is a neon, pulsing portrait of grief, and an electrifying story of one woman's survival against all odds. Written in Richard Chiem's singular style, King of Joy is equal parts sledgehammer and sweet song, a neon, pulsing portrait of grief. Richard Chiem is the author of ​You Private Person, which was named one of Publishers Weekly​'s 10 Essential Books of the American West. His work has been published in ​City Arts, ​Vol. 1 Brooklyn​, ​Fanzine​, ​3: AM Magazine​, and ​Moss​, among many other venues. He has taught at Hugo House and at the University of Washington Bothell. He lives in Seattle.